Everybody expected it was Pruitt’s resignation the one to be carried out. However, the announcement did not meet the expectations of those who wanted him, the beggar who gave himself airs of king, to be off. Scott Pruitt remains in office, but two of his officials have taken off refusing to continue serving the United States Environmental Protection Agency (EPA). Democratic lawmaker Don Beyer has been hunting Pruitt but was surprised with Albert Kelly and Pasquale "Nino" Perrotta’s giving up their positions. Yet, Beyer believes that Pruitt should be the next to leave, although he called Kelly's leaving as positive. "He was never qualified to head the position," he said. The Environmental Protection Agency of the United States has made headlines since the organization has spent high amounts of money on Pruitt’s security. EPA’s director was called to give an account in front of a senatorial commission. According to media sources, Pruitt evaded all kinds of actions by commenting that his subordinates made the decisions without his consent. In a press release, Scott Pruitt, who has serious ethics and corruption pending issues, did not explain the true reasons why the officials left their positions but it is clear that Pruitt is “cleaning” EPA. The top head of the environmental agency wants to get rid of the eyes set on him and has publicly chastised Perrota in order to maintain his rank and, why not, to divert attention from the feds who investigate everything related to the budget’s overdraft. When assuming his position, Pruitt thought Perrota was the ideal candidate to take charge of security since he was a former experienced Secret Service agent. With his curriculum, Pruitt didn’t hesitate to hire him but problems would come later. Millions of dollars were spent by the agency on the payment of the security staff of EPA’s director. 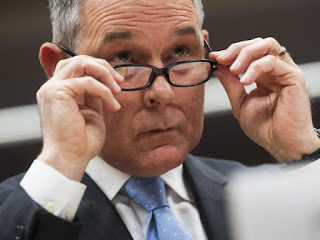 Scott was not wrong, Perrota was the right person for the task but it seemed the ex-agent still kept the secret service’s old ways and the expenses were three times higher compared to the years of Pruitt's predecessor. Pasquale "Nino" Perrota quickly expanded the time of the 20 men who protected the boss. Pruitt was escorted day and night, even on holidays. The "paranoia" was so extreme that during the family vacations 3 million dollars were spent, including travel costs. Now the guilt falls on Nino’s shoulders and although Scott's movement has been clever, there are still several binding clues to the case that involves him in a possible corruption scandal. It is not possible for the director of the agency to agree on contracts for such exorbitant figures without even saying anything. However, concerns about Pruitt’s safety are real due to the numerous contradictory measures taken by the agency, especially the pale and weak EPA’s reaction since the president of the United States decided to leave the Treaty of Paris. Fortunately for taxpayers, the feds are following his steps to find out if “Scottie” made another wrongdoing and took part of the profits for the "supposed" contracts. Among the services received there were first-class flights with security staff’s members, "premium" status in airport VIP’s halls, and the renting of a $ 43,000 noise-free cabin. Scott Pruitt praised the work done by Nino and his dedication to it and announced Perrota’s retirement. Meanwhile, regarding Anthony Kelly, he commended the "huge influence" of Kelly’s on the program in charge of cleaning toxic waste places known as Superfund. Kelly was an Oklahoma banker, precisely where Pruitt was Attorney General, and his job was so “goodly” executed that bank feds forbade him to work in the field for unspecified reasons. On this subject, the Democratic legislators have requested the intervention of the Federals. The loans directly involve Pruitt who apparently returned Kelly the favor with a position at the agency. Taxpayers now wonder who will decontaminate Scott Pruitt?